How to clean VLC’s network history! All you need to do this tweak, is Notepad or Notepad++ (which I highly recommend). VLC can keep a history of your recently open files and you can choose to enable, disable or simply clean the history whenever you want. Okay, that’s cool… but I wasn’t able to clear the network history (files played from a URL). 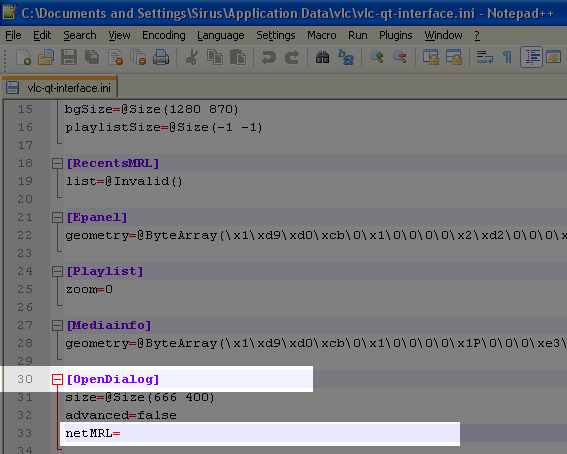 Once you’ve found this config file (.ini extension), exit VLC and simply edit the file in Notepad/Notepad++ and remove all the history (text) after the “netMRL=“. That’s it! After you’ve removed the text, restart VLC and you’ll now have a brand new, clean history, ready to be filled again!